The equinox = max or min is just an approximation due to the fact that the galactic center is close to the December solstice. For now - it won't be true in 5000 years due to precession. It is not an artifact of something we did in subtracting off the dipole? BTW, speaking from experience, that is the perfect age that you have, Bee! Just try to stay at it as long as possible :). Thanks for the post and the Einstein quote. I have always wondered why this local measurement of ambient radiation is called "cosmic." I know that there is a section of the universe which is totally dark to us. From that dark region no information at all reaches us, including radiation. I was wondering if it is a little presumptious of us to call this radiation cosmic since this is a local radiation. I would appreciate your comments. Alignment in galaxy clusters has been observed for a very long time. Here's a 1993 reference. Another odd case of alignment is seen in cosmic rays. By SR, you can analyze cosmic rays in the lab frame, and there is no obvious reason for multiple alignment. A preferred reference frame gives the target a velocity relative to that frame, and so defines an alignment. The same argument applies to galaxies. Your as old as my oldest daughter. The second guess would be that the subtractions of the galactic background are less than perfect and that the sun lies slightly north of the galactic disk. Dear Bee: Thank you alot for your post! I learned alot too. was designed to mitigate much of the confusion that can arise from these various sources by carefully selecting the operation frequencies, angular resolution with a scanning strategy to detect well the gravity wave background. I am looking forward to hearing their results. One reason why I'm intrigued by this experiment and the other CMB research is we have a potential (with some beginning collaborations) for cross-pollination between two disparate scientific groups that almost never talk to each other: the solar system dust researchers and the cosmology researchers. That is, people working on the smallest particles that exist in the present time in the most local region of space talking to the people working on the largest objects that existed in the farthest time! All because the dust quadrupole and octopole alignment with the ecliptic plane is not understood. I think such a cross-pollination will be productive for everyone. Thanks! So it is just a coincidence, and a temporary one in addition. I am glad to hear that, I've been twisting my brain trying to relate various coordinate systems in the sky. No, the statistics seems to be pretty reliable (at least to me, I'm not an expert on this, see e.g. papers by DJ Schwarz), and the results depend only little on the data set used (the different symbols lie close together). Also, when you subtract off the dipole wrongly I don't think you could ever get all the normals of the higher multipoles to come so close together. I'd think you would end up instead with overlying the higher moments with some dipole-like signal, which would shift them and maybe bring even closer together. I'll try to stay 30 ;-) I hope constant travel close by c helps in this regard. I know that there is a section of the universe which is totally dark to us. From that dark region no information at all reaches us, including radiation. Yes, there is (probably) a region of the universe about which we have no information because it hasn't YET reached us. The reason is that the speed of light is finite, and what we see today, whether in the visible or in the infrared, can't reach back farther than that. The longer we wait, the more we see, because the light from the more distant places will reach us. Thanks for your comment. Your comparison with the drum isn't completely appropriate for the standard FRW case, because in this case you have no 'center', and no 'border' that could possibly give the excitations a certain orientation. You might want to picture it as banging on a sphere (though it would be hard to get the sand stay on it). You might get such alignment effects for an inhomogeneous metric, or a non-trivial topology (both of which can point out certain directions), this is one of the approaches to explain the alignment. I don't see however how this could possibly explain the alignment with the solar system, without additionally turn this axis in a specific direction. that the subtractions of the galactic background are less than perfect and that the sun lies slightly north of the galactic disk. but such a systematic error would lead to an asymmetry with respect to the galactic northern/southern hemisphere, not with respect to the ecliptic, as data for the quadrupol look like? so, you mean that there may be a relevant contribution to the dipole, quadrupole and octopole from dust in the solar system? That's interesting. What is known about this dust today? Do you have suggestions for further reading? thanks for the references... I guess there are lots of more data available now on cosmic rays and galaxy clustering than there was ten years ago. Do you know whether there has been any follow-up research, or a more recent analysis of these correlations? The problem of making predictions from theories that have landscapes of possible low energy parameters is reviewed. Conditions for such a theory to yield falsifiable predictions for doable experiments are given. It is shown that the hypothesis of cosmological natural selection satisfies these conditions, thus showing that it is possible to continue to do physics on a landscape without invoking the anthropic principle. In particular, this is true whether or not the ensemble of universes generated by black holes bouncing is a sub-ensemble of a larger ensemble that might be generated by a random process such as eternal inflation. But it's an impressive word! Hmm, could as well be Greek, no? I.e. I think the Latin word 'monopolia' goes back to a Greek word. And most of these funny shaped things are named in Greek, like the icosidodeca-thing and the rhombicosidodecahe-blub etc. Just looked it up: the Latin word for 16 is 'sedecim'. Hi Bee, then did you read it, what do you think? are there more observables that might render these anomalies convincing? In particular, can future CMB polarization maps provide more information about these issues, given the fact that polarization is sourced by quadrupole anisotropies (and dominated by reionization at large scales)? Where one suspects Chladni one also wonders about Voronoi and Dirichlet cells. The cosmic mass sector looks like foam with thin walls, large voids, and densfied intersections. What physically meaningful lower dimensional boundary conditions birth the distribution? All must be in place before inflation, when the boundary was sufficiently close to itself to interact. Sanding a sphere is easy! Weakly multipolar magnetic sand (ferrous alloy surface, charged polystyrene foam pellets Idielectric surface), fine mist of water droplets (hydrophobic surface). What about the volume? Uniformly coat a sphere with a thin dilute bonded layer of triplet fluorescent dye. Vibrate away! Different air pressure at nodes and antinodes moldulates oxygen fluorescence quenching. A narrow pass filter removes the weak excitation background and isolates the net signal. All you (strobed for frequency selectivity?) see is the pattern, and nothing on the surface need net translate. It reports on a permeable volume, too (e.g., a dyed aerogel sphere). this is an interesting question! I don't know, but the polarization data has been fairly new, so I guess we'll have to wait what the analysis says. I would think this might help to sort out some of the proposed explanations, it seems to me they wouldn't all affect the polarization in the same way. Sanding a sphere is easy![...] What about the volume? Nah, no volume. That's the point. To get an analogy you'll need something without boundaries, and the volume has a center. Now that I think about it, it's more complicated. How do you 'bang' your sphere without breaking homogeneity? This is pretty off-topic. You find my opinion in footnote 5, or in the comment section to Lubos's post on Vilenkin's paper. Essentially, I think if one goes so far to consider producing black holes through quantum effects that nobody has ever seen, one can't neglect the quantum effects that cause the same black holes to evaporate and decay. How do you 'bang' your sphere without breaking homogeneity? Volume is OK - place the center of the volume outside the sphere. I know of one such empirical example. Big sucker, too. Bang it with a scalar field. A chiral pseudoscalar vacuum background is testable. We're working on it. Size is good but they should be clear as glass. Benzil can't be grown to spec from a melt given plastic deformation during cooling. We'll try the Thiele maneuver from solution. Another month or two blown. Sabine says that the Greek word monopole is Latin. Then she says that the Greek di- is Latin, too. After she correctly says that quadru- is Latin (Greek is tetra-), she says that the Greek octu- is Latin, too. After all these errors, I innocently say hexadecapole and you correct me, without having corrected Sabine. See this page to learn which languages gave the prefixes. "Yes, there is (probably) a region of the universe about which we have no information because it hasn't YET reached us." Thanks for your reply. Maybe I am being totally dumb here. But if the background radiation we measure locally is not cosmic why is NASA calling it cosmic radition? Maybe I am misunderstanding what you wrote. Is there a place you can recommend where I can find an authoritative answer to this question? It seems to me that since there is no radiation coming from the dark side of the cosmos this radiation is not cosmic. If this radiation is not cosmic and if NASA is calling it cosmic this is a serious scientific misrepresentation and I would take legal action against NASA. What is your opinion? Would this argument hold in a court of law? The thermal emission of interplanetary dust in our solar system introduces components that must be removed in order to extract the cosmological parameters of interest. For me, as a 'dust' person, it is funny to see paper titles like "Infrared Space Observatories: How to Mitigate Zodiacal Dust Interference", because that dust 'interference' is the object that I'm most interested to study! I'm not a zodiacal cloud expert (*), but one of my 'zody dust' friends/colleagues in Germany finished a summer contract working on a cosmological problem like what I described in my previous post, so I'll ask him if there is a paper yet. I know that one of the first papers to model the zody cloud based on COBE data was this 1998 Kelsall ApJ paper (showing how used is this model). I think this ApJ paper by E.L Wright, shows how complicated is the zody cloud modeling. And a recent paper that describes the zody contributions in the long wavelengths with a view towards the Planck mission is Zodiacal Light Emission in the PLANCK mission. I guess it's worse ;-) He's a loyal spouse who knows equally little Latin and Greek as I do. But thanks for the clarification! But if the background radiation we measure locally is not cosmic why is NASA calling it cosmic radition? Maybe I am misunderstanding what you wrote. I sense indeed that we have a misunderstanding here. Would you please explain what you understand under the word 'cosmic'? I doubt that NASA has a very precise criterion how to use the word, but I'd say it's radiation, and it's not from a local source but dates way back into the history of the universe, so the name is appropriate. Since we've already noticed that my Latin isn't the best, I won't attempt to translate 'cosmos', but NASA's use is definitly not a serious scientific misrepresentation since there is afaik no serious scientific prescription in which context the use of the word 'cosmic' is allowed. Maybe it is a good idea to state this again: If we talk about a possible "local" origin of parts of the microwave background, we are talking about a very very tiny part of this radiation, on the order below 1 part in 10.000. Again, there are tiny contributions to the radiation that come from other sources: the dipole caused by the motion of the sun, and the radiation from the Milky Way, and, maybe, some so-far not completely known contribution from dust in the solar system. But all these contributions are really small deviations from the uniform "fridge" signal. thank you for the explanations and the references! The Zodiac light is light from the Sun reflected by the dust. Is that also true for the main share of radiation in the infrared and microwave band emitted by the dust? Is that reflected sunlight? Or is this dust (or some parts of the dust) thermalized at some low temperature, so that it makes sense to speak of thermal radiation of the dust? In the first case, if the radition is mainly reflected sunlight, is there a chance to separate it from the cosmic radiation using polarization measurements? "The control of systematic errors in the measurement of the cosmic microwave background anisotropy and the need for measuring the interplanetary dust cloud at different solar elongation angles for subsequent modeling required that the satellite rotate." suggests to me that there is a subtraction from the interplanetary dust cloud that is done. Journal: Astrophysical Journal, Part 2 - Letters (ISSN 0004-637X), vol. 396, no. 1, Sept. 1, 1992, p. L7-L12. Research supported by NASA. Arun, I don't know. That reference you gave is 14 years old. Galactic dust 'contamination' is one reason for the BICEP experiment. My references in my previous post: the Planck paper by Maris describing the elaborate methods in the data reduction pipeline for subtracting the IDP dust and Wright's paper suggest to me that the problem is not an easily-solved problem. It's worthwhile to remember some of the characteristics of the interplanetary dust cloud. (A wiki entry I wrote from notes I took at a 1997 zodiacal cloud workshop). Plus the interplanetary dust cloud is time-variable, the Kuiper belt dust contribution to the interplanetary dust cloud is barely known with in-situ dust measurements giving the 'ground truth' of solar system dust measured only out to 18 A.U. (from Pioneer). Subtracting the zody cloud component to extract the cosmological parameters seems to depend on a very good model for the interplanetary dust cloud. Do we have that? Agreed that the paper is old, the questions I have are - is any correction done or not done in the dataset that Bee is writing about here? and does the improbable alignment with the ecliptic point to a problem with that correction or lack of correction? Since I like to make guesses before actually checking anything, my answer to the second question is yes. The research you are talking about will presumably definitively answer the question. Maybe more theoretical modelling is needed in face of the "physical artifact" of dust. Thanks for your comments and explanations. Sorry I didn't realize how imprecise my terminology was. In that picture let's call the white part K and the dark part U for Known and Unknown parts. The black section is the dark region where no information reaches us. This is the unknown area. We don't know anything about the unknown area (is this right?). For me then the word "cosmic" would mean K + U. In other words, for the Cosmic Background Radiation to be Cosmic it must contain radiation from U. But no information reaches us from U, therefore, Cosmic Background Radiation is not Cosmic, it is local. According to this reasoning the radiation measured by NASA in K cannot be cosmic because it is measured in K. It is a local radiation. What is measured must be local. If it can be measured it cannot be from the unknown part. Is this some kind of paradox? Or do you think there is something wrong with this reasoning? The link to flickr doesn't seem to work in my previous post. Here's the link to the Flickr picture of cosmos. at what time became the RT valid? when; after t=0 or t="Planck" was the speed of light,-the speed of gravity- defined? What you call Local=Known is everything that can be observed, due to the finite speed of light in an Universe of finite age, but this is very very much, nevetheless, and this is usually called "cosmic". When astronomers or astrophysicst talk about "local" things, they refer to the solar system, or the neighbourhood of the Sun in the Milk Way, or to the Milky Way, or to its neighbourhood, depending on the phenomena they discuss. it seems I already answered your question above. If you'd like to permit the use of the word cosmic only for 'everything that we observe and everything that we can't observe' then we would never use it, as we will never know there are no things that we can't observe. Since all microwave foregrounds from known sources must be removed to retrieve the cosmological data, great care is taken to map galactic signals accurately. Last year, while working on subtracting these foreground sources, Douglas Finkbeiner of Princeton University found an excess of microwaves from the galactic centre not accounted for by any other foreground signal. He cautiously termed this the "WMAP haze" and proposed that it could be due to the self-annihilation of neutralinos into relativistic electrons and positrons. You find some papers from Finkbeiner on the arxiv. I think it is still unclear whether or not this is an effect or a problem of data analysis. If it wasn't a data artifact however, it could be a local evidence for dark matter which would be pretty exciting! Sometimes seeing the abstract for what it can convey is just as important as what lies between the measure from that early universe to now? Thanks for your reply. Come to think of it I think you are right this seems about semantics. Although I am not that clear what semantics means. Thanks for you comment because it helped me understand that I was talking about the title of the database instead of physics of the database. We may title the database whatever. Probably NASA has an internal working title which is different than the marketing title Cosmic Background Microwave Radiation their marketing department came up with. We may title the database XYZ if we want to. This is what you called semantics, right? My problem, or what I am trying to understand, beyond semantics, is the connection of the data analysis to what data represents. I am trying to understand the assumptions the interpreters of the database make. It seems to me that data analysis is independent of the interpretation of the database. I don't know if you agree with the list above but where do you think physics research lies? In data analysis? In the interpretation of the data? And where does the science lie? Also: Universe is another database. Since this is so much fun I created another picture! Let's call the database of the entire universe DB2 as opposed to DB1 which is the CMBR. What is the relation of DB1 and DB2? Can you give me a scientific number for the ratio R = DB1/DB2? One thing I know is that R will be less than 1. I am trying to find out if DB1 is a representative sample of DB2. Are there any such statistical studies made that you know of? What do you think the value of R need to be for it to be a scientifically representative number? Thanks again. You have a nice informal and informative forum here. Hi Bee, thanks. I meant what do you think about CNS, will you let us know? where do you think physics research lies? In data analysis? In the interpretation of the data? And where does the science lie? You need to understand what your data is. You need to analyze it and extract the information you want. Then you can interpret it. I'd call it science if it helps you to understand nature better, potentially pointing into the direction to proceed, possibly resulting in applications of the knowledge. Let's call the database of the entire universe DB2 as opposed to DB1 which is the CMBR. What is the relation of DB1 and DB2? Can you give me a scientific number for the ratio R = DB1/DB2? One thing I know is that R will be less than 1. I am trying to find out if DB1 is a representative sample of DB2. Are there any such statistical studies made that you know of? What do you think the value of R need to be for it to be a scientifically representative number? I think you are heading into the direction of the multiverse. By definition if DB1 is larger than DB2, and DB1 without DB2 is the part of the sample that we can't observe, then there's no way to tell how large the ratio is based on the data because there's no data. If there was, then it wouldn't be unobservable. Thus, you can't say anything about R based on experiments unless you believe in some specific model about 'the entire universe'. It is commonly believed that what you call 'the entire universe' (DB2) is substantially larger than what we observe. Whether or not the rest of 'the entire universe' is correlated with our part of the universe, and whether our universe makes a 'typical sample' or an extremely unlikely one, are open questions. I hope that helps? I am not a big fan of CNS, you find some of my thoughts here. Dear Plato: Wolf-Rayet stars are dust producers, but not as important dust producers as other stars. See the Table: "Specifics of Dust Input to the Interstellar Medium" here. You probably meant something more esoteric put I prefer to not follow that thread further. As an aside, I notice at your blog that you have a small icon picture that is relevant to some of the spherical harmonics math discussion here, if you were not aware. In a 'previous life', I worked at Standford (programming and public outreach) for a helioseismology group, where I made that particular icon which you have placed at your blog. Deja-vu. It was to go along with the article I wrote introducing people to helioseismology (to which you have linked). That l-nu diagram is a diagram of oscillation frequency versus horizontal wave number (number of wave fronts) seen at the Sun's surface. The horizontal wave numbers correspond to spherical harmonic degree l. Bright spots occur where strong oscillations are observed, and each ridge marks different "overtones" of the oscillations. Modes with lower l and higher frequencies go deeper. Helioseismologists like to display their oscillation data that way, and it is a pretty picture besides. Amara:You probably meant something more esoteric put I prefer to not follow that thread further. Yes that is of interest to me and yes I knew your connection. I watched SOHO developing, and some of my points here are related to how I see helioseismology. The "simple experiment" of the chaldni plates is quite diverse as an analogy. Wayne Hu's examples in terms of polarization and the WMAP white lines were missed the first time? WMAP has produced a new, more detailed picture of the infant universe. Colors indicate "warmer" (red) and "cooler" (blue) spots. The white bars show the "polarization" direction of the oldest light. This new information helps to pinpoint when the first stars formed and provides new clues about events that transpired in the first trillionth of a second of the universe. Thanks for your answer. You write that “by definition DB1 is larger than DB2.” Do you mean the opposite? Because in my terminology DB2 = the entire universe and DB1 = CMBR. Would it be correct to rephrase what you wrote as: "By definition if DB2 is larger than DB1, DB2 without DB1 is the part of the sample that we can't observe, then there's no way to tell how large the ratio is based on the data because there's no data." Do you think this view is shared by cosmologists? I believe that if what you wrote is correct cosmology as this word is understood today would not exist. If we don't know R how is it possible to deduce the existence of, for instance, the expansion of the universe, from an observations of the motion of galaxies? Can you help me understand that missing link which I think is missing? You are saying that we don't know the unknown part and therefore we don't know R. To me to say that "Universe is expanding because we observe that distances between galaxies are increasing" implies a knowledge of U. Can you help me figure this out? If we don't know U how do we know that U is expanding? Similarly if we don’t know U how can we use CMBR as the evidence for Big Bang? yes, sorry, I mixed up your DS1 and DS2, the correction you made is what I meant. As I've tried to explain before, cosmology as we understand it today apparently does exist. What we mean with observation of the universe is observation of the part of the universe that we possibly can observe. It is just not possible to exclude from experimental evidence that there are things that we can't observe, since we can't observe them. It seems to me that what you understand under 'universe' or 'cosmos' is something different, something like 'everything there is' which might make sense philosophically but for the scientist measuring CMB is not a helpful notion. One way or the other, this is - as Stefan said before - just semantics (meaning what you understand of 'universe' might not agree with what NASA means). Most people today like to call your notion of 'everything there is' the 'multiverse' out of which our universe might (or might not, who knows) be only a small part. The statement that our universe (= the part that we observe) does expand can very well be made without knowing what happens in the whole multiverse (to the biggest part of which we are not causally connected to). which explains these issue in detail. Well, I don't know all cosmologists, but those who I know do indeed also think that the part of the universe that is observable today is not 'everything there is', but that our observation is constrained by the finite speed of light. Though not all of them believe in the multiverse as string theory seems to imply it. Thanks once again for taking the time to reply. Thanks also for the reference to Smolin's book. I'll check it out. I am unable to understand this statement. I think you are right that I am confused what this word universe means. What is your precise mathematical description of the word universe? I have no problem going along with your definition. As long as it is a definition. If your definition of the word "universe" is a multifinition then I would have difficulty understanding it. I know that I am not really that intelligent to grasp multifinitions. Then, they use the meaning which fits what they are trying to prove. This is too complicated for me to understand. Once agin thanks for discussing this issue with me. I think I now have a better understanding of what is going on. In that image I just put some numbers on the visible part of the universe. I assume that you agree that it is not possible for us humans to know how the sequence of numbers continue in the unknown region. Do you agree with that? If you do, can you please explain to me, in layman's terms, if those numbers represent data from CMB, how can cosmologists deduce information about the dark side? Thanks again for this blog. I find your and Stefan's articles very inspirational. I put also a comment in your new year post. Great articles. I also learned that you are a painter. I am also a painter but I am amazed that you can find time to paint and also keep up with this science stuff. By the way, I believe that art education was much more open than physics education. In physics authority rules and students are not allowed to question authority. For instance, in this case, I am not allowed to question the multifinitions of the word universe by cosmologists. I must take their authority or shut up. In art, on the other hand, students are encouraged to question authority. Sorry if this is off topic. Happy new year. If you use this equation and end up with strange results, you shouldn't blame the cosmologists! First, the concept that the Universe is much larger than its observable part stems from theories about the Universe which are based on well-established facts observed in our "local neighbourhood". For example, one now thinks that General Relativity is the correct theory to use for the description of the Universe at large scales. In this case, if the the matter-energy content of the Universe is what can be extrapolated from its observable parts, and if the Lemaître-Friedmann-Robertson-Walker models the the Universe (which assume that the Universe "looks the same" everywhere and in all direction - I come back on the meaning of the "all the same" in the second answer) are appropriate, the Universe is spatially flat and infinite. This means that your ratio R = Known/Unkown may even be zero. Now, why is this not completely silly? A very important pre-scientific assumption is that the laws of physics as we can deduce them from experiments and observations on Earth are also valid where we do not have observations, and that some properties of the physical world at places that we haven't seen yet are similar to what we know. For example, to my knowledge, no one has ever observed planetary systems in the Andromeda galaxy. Nevertheless, it would be quite unreasonable to assume that there are no planetary systems in Andromeda, or that these planetary systems would not behave as described by Kepler's laws. This is quite similar to the assumption that the Sun will rise tomorrow, since everything else would be an unreasonable and idle speculation. Second, when discussing extrapolations from the known and observed parts to the unknown and unobserved parts, it's important to keep in mind that you can say something only about gross statistical properties, and not about every detail. When one says that the Universe "looks all the same" everywhere, one does not mean to say that the exact positions of stars and galaxies in the sky are the same everywhere, but that the mean density of matter (as measured by the distribution of galaxies on a sufficiently large scale) is the same everywhere, that statistical fluctuations around this average are the same, and so on. Or, to come back to the example of planetary systems in the Andromeda galaxy, you can't, of course, not predict which star has planets, and what are the orbital parameters and masses of these planets, but as soon as there is a better understanding of planetary systems in the Milky Way, for example from the COROT mission, it will be perfectly reasonable to transfer the statistical properties of planetary systems in the Milky Way to those, yet unobserved, of M31. I assume that you agree that it is not possible for us humans to know how the sequence of numbers continue in the unknown region. Do you agree with that? Is just plain wrong, as I've also explained repeatedly. I have made my statements very precisely and have referred to the observable universe, you can define that as the part of the universe that is in causal contact with us (everything that is in the backward lightcone). As I've mentioned before your notion of the universe as 'everything there is' is what might make sense philosophically, but I don't see how one can 'define it mathematically'. Since you are the one talking about it, I'd ask you to 'define' your notion of 'cosmos' or 'universe' as I have asked you before and you didn't answer. Btw, I have no idea what your problem with the title 'Doctor of Philosophy' is. Admittedly, I don't think the 'doctor' is a good thing. It often confuses people (esp. in foreign countries) who associate 'Doctor' with 'Doctor med'. Your accusations against people who hold a PhD seem to be based on a lot of bad experiences and prejudices. I am sorry for that, but I agree with Stefan that these statements, taken seriously, are blatant insults of many readers of this blog and a slap in the face of its owners... since we're both holding a PhD. It takes a lot of work to get it, and I actually think I learned something in the years it took. I thank you once again for being kind and replying to my comments. I like your blog. I don’t want to name names but when you compare Backreaction to other so-called physics blogs yours stands out. I like the tone, the sense of humor and the serious pieces as well. I am heeding your warning that most of your readers would be offended by my rant about Doctors of Philosophy so I decided to post my reply/essay on my own blog instead of a comment at Backreaction. I've had a look at your blog. You are writing And if more people let me know what they think I believe this would be a nicer blog.. I think your blog would be more useful if you'd follow your own advises. You are raising various claims about 'doctors' who have allegedly 'corrupted physics' and turned it in to a non-science, claims that are not supported by any evidence and have no contact to reality. I have no idea why you think so, but if this is what you are convinced of then you should start with examining some cases that support your conspiracy theory. You are also wrong that physics is a field void of any ethic. In fact, most physical societies have an ethical codex. E.g. the German Physical Society (DPG) calls it 'Verhaltenskodex' and it contains points like experiments have to be reproducible, that publications have to properly state experimental and theoretical methods used, it addresses things like conflicts of interest, authorship of publications, etc. I am not sure whether the APS has a similar codex, but at least they have some statements including Guidelines for Professional Conduct, about the question What is science, or the Policy on Equal Professional Opportunity. With respect to the dust foreground "contamination" role in the CMB anomalies. I think that there must be few dust astronomers working on the zodiacal dust cloud at microwave wavelengths. Most of the zody dust astronomers (of whom I'm aware) work at infrared or visible wavelengths. The one dust astronomer I know working at trying various dust interplanetary cloud models, in order to see if the CMB anomalies can be reproduced, does not have a paper yet; he told me last week that his work is still in progress. (I can update you when he has firm results/a paper.) So then I don't know what to add to the theme of the possible microwave signatures that the foreground interplanetary dust cloud might be giving. But infrared and visible is easier because I have a couple of references. "To generate the full-sky dust maps, we must first remove zodiacal light contamination, as well as a possible cosmic infrared background (CIB)." "These dust maps will also be useful for estimating millimeter emission that contaminates cosmic microwave background radiation experiments ..."
The funny thing about this paper is that the authors are interested to generate full-sky dust maps, so they have two challenges, which are to remove the zodiacal light contamination as well as a possible cosmic infrared background. They say that at 100 microns, they don't detect significant cosmic background, but that at the longer wavelengths they do, and they give the flux levels (listed in the abstract). Therefore if _they_ detect it, then presumably the astronomers working on the cosmic background detect foreground dust at those same wavelengths. "Another important application for maps of the diffuse emission is comparison with cosmic microwave background radiation (CMBR) fluctuation maps. Recent analyses of the COBE/DMR fluctuations et al. (Kogut 1996) show a positive correlation with DIRBE maps, particularly in the North Polar Spur region. Similar correlations are seen between the Saskatoon CMBR maps and the IRAS maps (Oliveira 1997; Leitch 1997; Jaffe et all 1997) This is unexpected, since these 40 GHz CMBR experiments are not sensitive to dust emission, but are sensitive to free-free emission from the warm ionized medium (WIM; Gaustad, McCullough, & Van Buren 1996; Simonetti, Dennison, & Topsana, 1996) This implies that the WIM is at least partly correlated with the cold dusty medium and that our dust maps could be used as a model for both components (Reynolds 1995). Alternatively, the observed CMBR correlations might be explained by small spinning dust grains producing continuum emission in the 10-100 GHz range (Draine & Lazarian 1997)in which case, the dust maps should correlate extremely well with CMBR observations over the entire sky." The longer discussion is in section 7.4: "Measurement of the CIB", and they say that a more detailed analysis of the cosmic background by the DIRBE team is underway (this was in 1998). So if you search on the names of Hauser, Kelsall, Arendt, or Fixsen, for example, you should find more papers by the DIRBE team on this CIB topic. Here is a more recent paper, discussing a planned new rocket experiment: "The Cosmic Infrared Background Experiment". There is an astro-ph version of the paper: astro-ph/0510587. Their Figure 1 shows a nice summary of the extragalactic background at near-infrared and optical wavelengths. The text above says that "zodiacal dust models are not unique and represent a leading source of systematic error". Finally, the last reference I want to give is in the book: _Interplanetary Dust_, editors E. Gruen et al, in the chapter: "Optical and Thermal Properties of Interplanetary Dust" by A.C Levasseur-Regourd. This chapter is about 35 pages of detailed numbers for properties of the zodiacal dust cloud. She doesn't discuss the cosmic background, but if anyone wants to have numbers in the visible and infrared for the interplanetary dust cloud, then this is an excellent reference. Bee wrote: "I have no idea why you think so, but if this is what you are convinced of then you should start with examining some cases that support your conspiracy theory." Thanks. I will do this, and I'll report here with some specific cases. But now I am back to work after a long vacation and I was just reading your comments about cosmology in order to reply to those first. But I don't really believe that there is a conspiracy. I believe that there is a professional monopoly. Ok. No problem. Sorry I must have misunderstood you. You and Stefan are welcome to comment on my blog. Your comments have been helpful to me. As I said there I am looking for evaluation by people who know much more than I do on these topics. Since you are the one talking about it, I'd ask you to 'define' your notion of 'cosmos' or 'universe' as I have asked you before and you didn't answer. Do you want me to answer this? on my blog. Please take a look. Print the latter two of the three CMB pics. 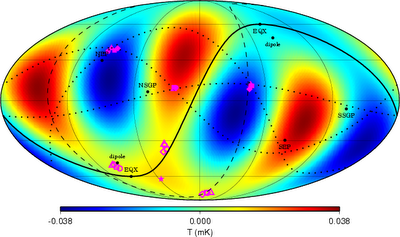 Plot out the Solar dipole with that depicted in the CMB... they are close but don't match up. That fact that the Solar dipole intersects features of the Cosmic multipole is coincidence. Further, if you print, you can see that features from the dipolar plumes turn up in the next resolution, which would truly make this a Universe dominating structure. To find the features, draw out the two plume halos on the first pic, put it over the second printout so the two pics align, and flip up and down so the two plumes prominate in the third pic. The yin-yang effect then become features of the Cosmic dipole. If the near syncronicity of the two dipoles seems impossible, then explain how our moon is in syncronous orbit around Earth, Sol is in syncronous orbit around the Milky Way core and yet is now at the exact crossroads (Sagitarius arm) between our new Galaxy and our old one (Sagitarius Galaxy feeding the Sag arm)? It's like a big clock made just for our perusal, saying come hither, ye hairless apes... and BEHOLD! Hello if anyone is there. I was just wondering if there were any developments since 2007 on the alignments? Thank you.